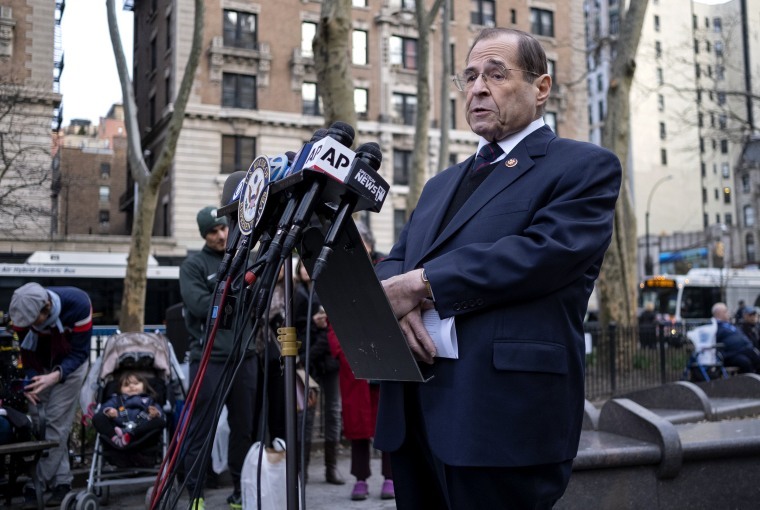 WASHINGTON — House Judiciary Committee Chairman Jerrold Nadler has contacted the Department of Justice to set a date for Attorney General William Barr to testify on special counsel Robert Mueller’s Russia report, according to a senior aide involved in the process. Those discussions are taking place as some committee Democrats are saying Barr must fill in more blanks on the report within the next week, according to a lawmaker and senior leadership aide. Committee Democrats are huddling this evening to discuss their next steps, according to two lawmakers on the committee. Meanwhile, Barr is also scheduled to testify before a House Appropriations subcommittee on April 9th to discuss the department's 2020 budget, according to a committee spokesperson. On Sunday following Barr’s release of his four-page summary of Mueller’s report, Nadler, in a joint statement, called on Barr to testify before his committee “without delay,” but did not offer a timeline. Barr's summary to Congress revealed that the special counsel had found no proof that President Trump criminally colluded with Russia. The attorney general also said that while the report did not reach a conclusion about whether Trump obstructed justice in the investigation, he found insufficient evidence to further pursue that matter. Democrats are also calling for more excerpts from the Mueller report to be made public, in addition to the underlying documents Mueller obtained throughout the course of his two-year investigation. In Sunday night’s statement, Nadler, along with House Intelligence Committee Chairman Adam Schiff and Oversight Committee Chair Elijah Cummings, said Barr’s summary “may be a partisan interpretation of the facts” in Mueller’s report. They said that in June of 2018, Barr telegraphed — in an unsolicited memorandum to the Justice Department before his appointment as attorney general — that the Mueller investigation was “fatally misconceived,” calling into question Barr's "objectivity,” particularly on the question of whether the president obstructed justice. They also noted that Barr made his decision not to pursue obstruction of justice charges within 48 hours and without consulting Mueller or interviewing the president. In the Senate, Judiciary Committee Chairman Lindsey Graham, R-S.C., called on Barr to release as much of the report as possible, while leaving it to the attorney general to decide whether to brief the committee. He was also non-committal on whether Mueller should testify before his committee.